For this week’s Energy and Capital, I argue that instead of forming climate policy around what comes out of the smokestacks and tailpipes, we should be focusing on what we put into the engines and encouraging renewable energy with incentives like feed-in tariffs. When it comes to setting policy, we certainly do seem to have a way of putting the cart before the horse. Instead of probing for the root cause of the global financial meltdown—deregulated, irresponsible and leveraged speculation on inflated assets—and doing something about it, we bail out the perpetrators and then let them dissemble and deny what really happened in order to keep the game going. Instead of formulating a long term plan for the energy crisis we are hurtling toward, we argue about whether we should invest in Green or Brown energy, without understanding that we’re going to need both. Instead of realizing that the energy is the only real currency, the shortage of which is the source of our economic stall-out, we play wildly reckless games with fictitious fiat currencies, like printing $2 trillion out of thin air, without creating any new energy. And instead of focusing on the fuels we hope to put into our power plants, we make policy around what comes out the smokestack. As much as I want to rejoice that we’re finally tackling the climate change issue, having spent the last 15 years of my life pushing for it in one way or another, I can’t help but think we’re going about it all backwards. At the Rothbury Festival in Michigan over the holiday weekend, I had the privilege of sitting on several “think tank” panels discussing energy, climate change, and sustainability. Most of my fellow panelists were focused on climate change and sustainability, not energy, so I outlined the peak fossil fuel concept and suggested that given the infantile state of renewable energy, we are in a race for BTUs, not a race against CO2. I also noted that studies by professor Kjell Aleklett (Uppsala University) and professor David Rutledge (Caltech) have called into question whether we will even burn enough fossil fuel to reach the 450 ppm target on CO2, given their models of the peaking and depletion of oil, gas, and coal. I don’t think my case went over very well. The nearly two-decade history of efforts to control climate change is rife with failures. The Kyoto Protocol, for all the bluster and ballyhoo that has gone into it, has had no actual effect on carbon emissions worldwide with its unenforceable “binding” targets. Climate policy has also resulted in number of untoward and unintended consequences. The first serious carbon trading market in Europe led to exploitation by traders with complicated international exchange schemes that made easy money for the underwriting banks, but didn’t reduce carbon emissions. Emissions reduction efforts in Europe and the US have in part caused production to move to Asia, where energy efficiency is lower and hence, emissions are greater. Without global cooperation, national emission reductions are nullified by capital’s tendency to move wherever costs are lowest. But global cooperation remains elusive; witness the ineffectual squabbling at the current G8 meeting. Over the last several years, we have seen mandates for first-generation biofuels result in skyrocketing food prices, further environmental degradation and even grain shortages (although the latter were mostly in the Third World, conveniently out of sight of climate change policymakers). Substituting “CO2-neutral” biomass fuels for fossil fuels—burning wood for heat instead of fuel oil or natural gas—in order to meet high CO2 reduction targets could paradoxically result in increased airborne black soot, which is believed to exacerbate global warming. Renewable portfolio standards (RPS) are toothless without investment in new renewable energy production. California, which sports the highest RPS in the nation, is nowhere near being on track to actually meet its targets, while utility scale solar developers have been struggling to get even a single permit approved to move forward with their plants. Focusing on emissions also goes against the capitalistic grain, and so it meets a great deal of resistance. The dialogue becomes about who will pay the price, not how to meet the challenge. Concerns about the future cost of carbon emissions have contributed to investors’ reluctance to sink new billions into oil and gas projects, thus crucially depriving us of adequate fuel supply in the 5-10 year time frame, when we’ll be needing it to build renewable energy machines that will make up for the depletion of fossil fuels. The report notes that the carbon intensity of the global economy actually rose from 0.27 tons per additional $1,000 of GDP in 2000 to over 0.53 tons in 2006. Put the opposite way, the decarbonization of the world’s major economies has been falling steadily since 1990, as shown in the following chart. 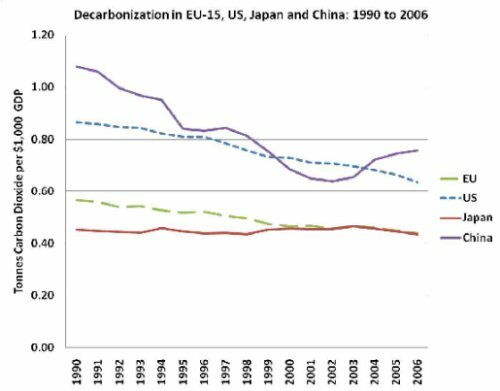 Despite its refusal to participate in the Kyoto Protocol, China has improved its decarbonization over the last decade, whereas the EU-15, which did sign, has continued to worsen. If we really want to motivate capital to address the climate change problem, and motivate people to apply their entrepreneurial energies, then we need to incentivize the solutions, not penalize the problems. One such incentive is feed-in tariffs (FITs), which pay a premium for renewably-generated electricity. It’s a market-based approach, it’s simple and incorruptible, and it’s demonstrably effective in reducing carbon emissions. FITs have resulted in an explosion of rooftop solar in over 37 countries worldwide including Germany, Japan, Denmark, Italy, Greece, France, Netherlands, Spain, Portugal, and Bulgaria. The US has not supported FITs nationally (although 11 states are contemplating it), and so has watched its share of global photovoltaic manufacturing capacity dwindle from 40% to 7%. FITs have a number of important side benefits as well. Because the power is generated where it is used, little to none is wasted in transmission elsewhere. They encourage local investment, instead of sending money to some far-off place in hopes it will reduce emissions there. They ensure a steady, growing market by having long (10 years or longer) lifespans, instead of ensuring boom-and-bust cycles as our short-term tax credit incentives do. They insulate both utilities and the consumers who install the panels from the wicked volatility of fossil fuels by having a fixed, known cost under contract for as long as 20 years. And they result in an installed base of clean generation capacity that will produce for 50 years or more, contributing to true long-term energy independence. Consider the success of Germany. Its 10-year goal to double the share of electricity produced from renewables by 2010 was met three years early under the FIT, and the country now produces more than 15% of its total energy from renewables, more than any other country and far more than the 4% generated in the US. It now produces about half the world’s total solar capacity, despite having about the same solar resource as cloudy Juneau, Alaska. Another truly effective approach is to incentivize efficiency in heavy industry and power generation, which are major sources of carbon emissions. Japan’s iron and steel industry reduced its CO2 by 19% from 1991-2008 via efficiency gains, according to the LSE report. And the IEA estimates that using the best available technologies in fossil fuel power generation would save 1.8-2.5 Gt-CO2/year, equivalent to China’s total CO2 emissions in power generation. Decarbonizing solutions to the peak energy problem will also solve the climate change problem. But the focus should be on shifting the primary energy loads to renewables, not chasing a fuzzy and much-debated concept like global warming. If we can solve the peak oil, peak gas, and peak coal problems—all of which are likely to occur by 2025—by switching to an all-electric infrastructure increasingly powered by renewable energy, the CO2 problem will take care of itself. Energy analyst Chris Nelder offers highlights of the energy policy debate at the 2009 Offshore Technology Conference (OTC) in Houston. Energy analyst Chris Nelder considers the long time frames of energy transformation and the energy illiteracy of most Americans, and finds a profit opportunity in the ignorance gap.